The only way Elizabeth feels she can still communicate with her husband Mike is through letters. He died when he was saving a nineteen-year-old girl, Kate, from drowning. Elizabeth doesn't know what happened and Kate doesn't seem to be able to remember anything. Elizabeth's grief is overwhelming, she misses Mike so much she can hardly cope with the loss. She can't believe she's a widow while she's still so young. Their life together was perfect, or wasn't it? How did Mike end up in the water? Something isn't adding up. Elizabeth is too sad to see that Mike might not have been the perfect man she believes he is. Mike was keeping secrets and she can't ask him about them anymore. What was Mike hiding from her and what are the consequences of his actions? By dying he's broken Elizabeth's heart, will she ever feel whole again? And when the truth comes to light, will Mike's actions shatter the already fragile woman completely? Letters to My Husband is a sad story filled with grief, secrets and lies. Stephanie Butland writes about Mike's suspicious death and the effect it has on everyone he leaves behind. His widow Elizabeth can hardly keep going. She loved Mike unconditionally and my heart ached for her. There's so much she has to go through and losing her husband isn't enough, there is more. Through secrets some of the heaviness of the story is being taken away and replaced by fascination. I was gripped from the start and was curious to find out what Mike was hiding. Stephanie Butland has a great compelling writing style. I liked how she plays with tension and couldn't wait to discover more about the mystery around Mike's death. 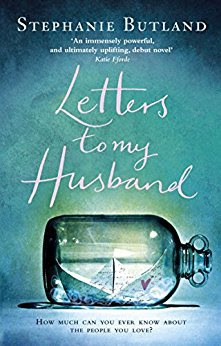 The main characters of Letters to My Husband are going through an emotional rollercoaster and Stephanie Butland describes what happens to them in a beautiful emphatic way. Letters to My Husband is a captivating and moving story filled with unexpected twists and turns. I loved this poignant emotional book. If you can handle a sad story and love a good book about secrets Letters to My Husband would be a great choice. Now this sounds intriguing. I do enjoy a good mystery. Thanks for your review. Might be too intense for me, but it sounds well-crafted! This may be a little too intense for me. I worked with a woman who did just that - wrote to her recently deceased husband every night. She wrote about her day, the children's lives, how angry & upset she felt by his death and the process helped her to slowly accept the fact that he wasn't coming back. So while it does seem morbid it can help enormously. Sounds like a lovely suspensful read. I liked to about those secrets. It sounds like a heart wrenching story.